At a spine-crunching 750 pounds, the Evans & Sutherland Computer Corp. ESLP laser projector might not be the most portable projector on the market, but, at 32 megapixels (8,192 x 4,096 pixels), it is the highest-resolution (digital) projector out there. E&S is debuting two configurations of the new projector series for public consumption at this week's InfoComm 2008 show being held in Las Vegas. Targeted toward indoor venues, planetariums, control rooms, simulation and visualization centers, digital cinemas, and, potentially, my living room, the ESLP laser projectors use "NanoPixel technology" to deliver about 33.55 million pixels at 36 bits per pixel (12 bits each per red, green, and blue channel), for 16 times the resolution and twice the color range of 1080p HDTV video. 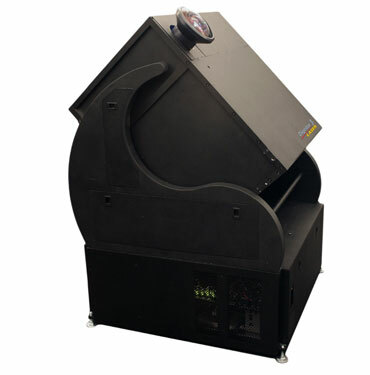 The system has been installed in some venues already as part of E&S' Digistar 3 Laser planetarium system (including the Samuel Oschin Planetarium at Griffith Observatory in Los Angeles, where it's been in place for about a year). This week's InfoComm show marks the ESLP's entry into the general commercial projection market, although it won't be available for about another year. The system uses three nanopixel chips (one for each color channel), each with more than 8,000 reflective elements. Using a "micro electro-mechanical system," the chips display all pixel rows in an image simultaneously, along with a horizontal scan mirror operating at 60 Hz to 120 Hz. It offers a response time (full on to full off) of less than 200 nanoseconds. E&S said the system has zero persistence (i.e., no smearing of moving images) and produces no visible boundaries between pixels. ESLPs do not, of course, use lamps. The lasers have a life expectancy of more than 30,000 hours. The two configurations debuting this week include the ESLP2-5, which offers a brightness of 5,000 ANSI lumens and a contrast ratio of 2,500:1. The ESLP2-2 has a brightness of 2,000 ANSI lumens. Lenses are available for flat screens, domes, and panoramic or cylindrical screens. Connectivity options include DVI, HDMI 1.3, HDSDI, and 10/100 Base-T Ethernet for control and diagnostics. "Years of research and unwavering dedication to creating the best projector possible have led to this moment--the unveiling of the ESLP projection system," said David Bateman, CEO and president of Evans & Sutherland, in a statement released today. "We believe this new technology will transform the audio/visual industry and bring a new definition of quality to digital projection systems." The standalone versions of the ESLP projectors will be available in mid-2009, according to E&S. Pricing was not available at press time, but we're thinking it might be a tad out of reach for most consumers. For those who would like to see the new systems in person, E&S will at booth N5023 on the main show floor at InfoComm.